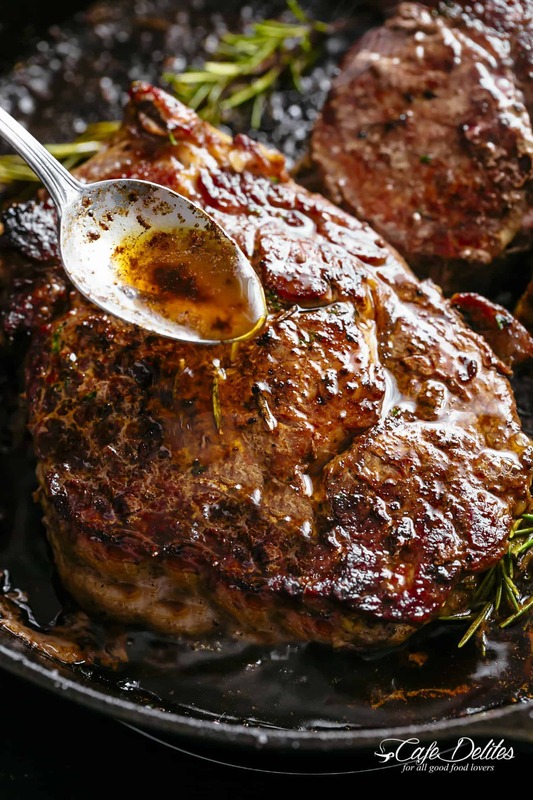 Juicy Butter Basted Steakhouse Steak right at home! VIDEO at the bottom of the post! 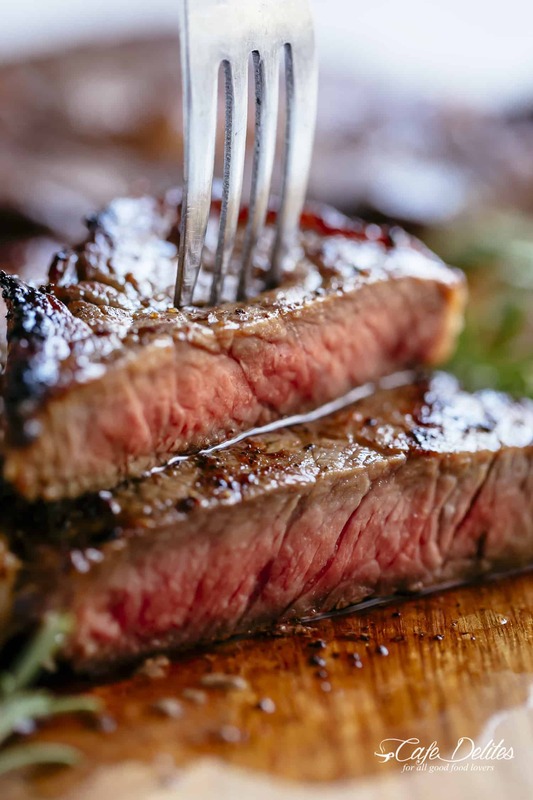 Good quality steak cuts work best to make Steakhouse Steak at home: boneless Ribeye (Australian Scotch Fillet), New York Strip (Australian Porterhouse) and Eye fillet are the best choices, followed by Sirloin or Australian Rump. All of these cuts are shown throughout this post to give you the BEST steak recipe. Start with close to room temperature steaks and pat dry with paper towel. Preheat your pan until smoking. Cast iron skillet is preferable or a heavy-duty, thick-based frying pan. Season steaks with salt and pepper just before they go into your pan. Sear one or two steaks at a time to get a nice sear. An oil that can withstand very high temperatures without burning is ideal, such as canola or coconut oil. Some chefs oil the steak and add it to a hot dry pan. We prefer to add oil directly to a smoking hot pan, get the oil hot and shimmering. A delicious, crisp and even golden crust will form on the outside of your steak. Using real butter adds richness. Save your butter for near the end of cook time to prevent butter from burning. Slightly browned butter is perfect, adding richness and a nutty sauce to serve with your steak. Fry garlic cloves and herbs in the butter for a minute — just enough time to release flavours. To baste steak, tilt pan carefully towards you. If you’re not comfortable with this step, tilt the pan away from you, just enough to pool butter on the side of the pan. Using tongs, rub steaks with the garlic for added flavour. How Can You Tell If A Steak Is Done? Rare steaks. Soft textured steaks that maintain an indent when pressed. Medium-rare steaks. 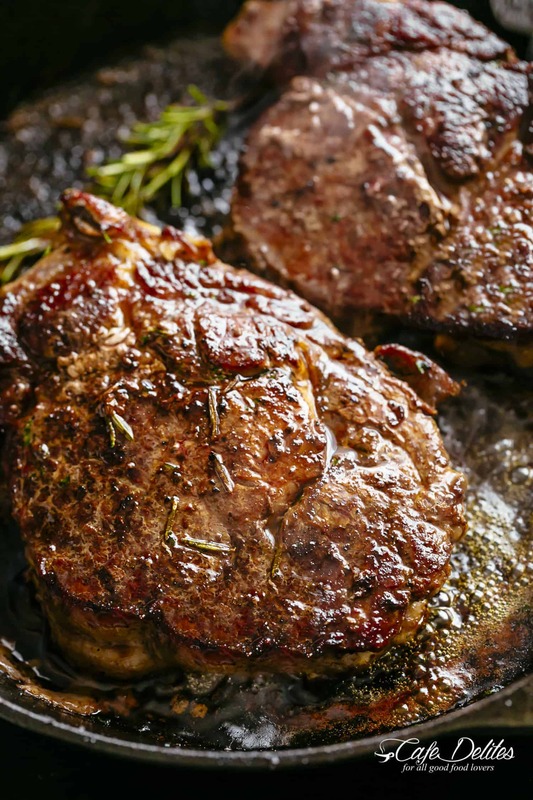 Steaks with a soft and springy feel. Medium steaks. Steaks with a slightly tighter springy feel and bouncy feel. Well done steaks. Firm or hard. For a well-done steak, cook for about 5 minutes each side, depending on thickness. 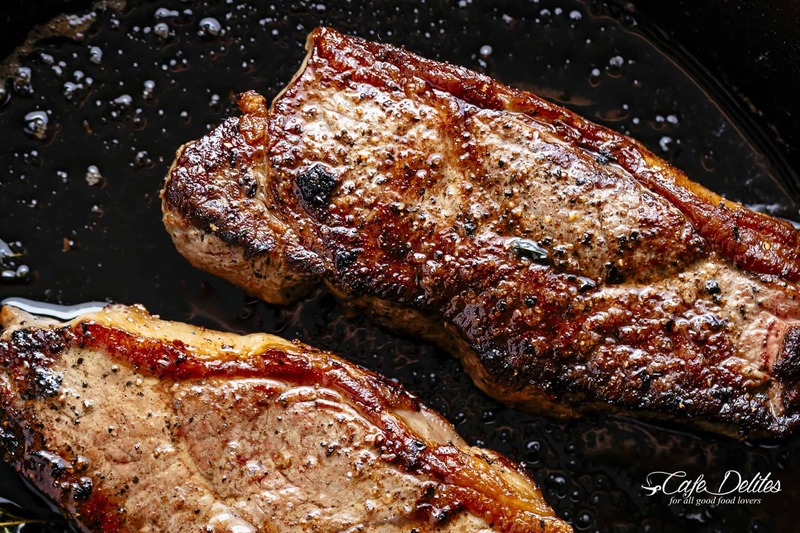 Some people prefer serving steak steaming hot straight out of the pan, while others prefer allowing it to rest for about five minutes before serving. Resting for 5 minutes allows the juices to reabsorb back into the meat before serving, ensuring the juiciest steak as possible. 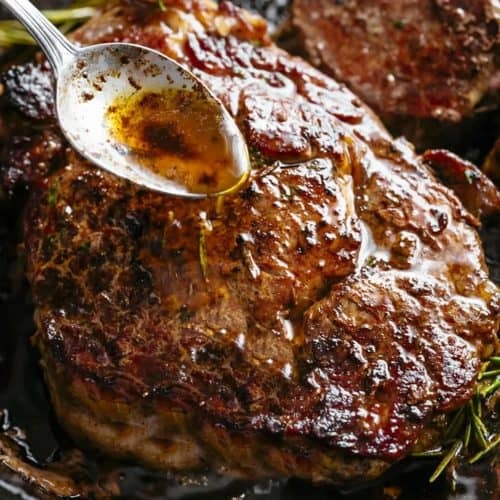 Juicy Butter Basted Steakhouse Steak right at home! Produce mouth-watering steakhouse steak in your very own kitchen. Tips to get buttery steak on your table in less than 20 minutes -- from start to finish. Take steaks out of the refrigerator for at least 20 minutes before cooking. Heat a large cast-iron skillet or pan over medium-high heat. Add 1 tablespoon of oil in and swirl to coat. Season steaks all over with salt and pepper just before they go into the pan. When pan begins smoking, lay the steak into the pan away from you I(one or two at a time) and cook for 1-2 minutes each side until crisp on the bottom, flipping and searing again for a further minute each side until you get a nice, even gold colour and crisp texture on the steaks. Sear the sides to render the fat for a further minute. Reduce heat to medium-low; add 2 tablespoons of butter, 3-4 sprigs of thyme (or rosemary), and 3 garlic cloves to the pan. Allow the butter to foam a little while frying the herbs and garlic for 1 minute to release flavours into the pan. 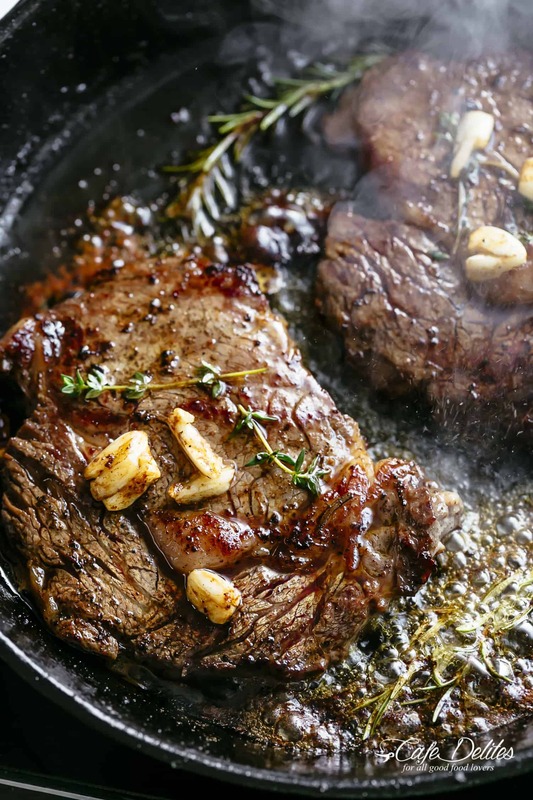 Place cloves on top of steaks and baste with the butter (use an oven mitt, hold pan handle and very carefully tilt pan toward you so butter pools in the pan, and baste steaks with a large spoon). Discard the thyme and garlic from the pan and transfer steaks to a plate. Pour the pan juices over the steaks and let rest for 5 minutes. Repeat with the remaining steak. This was absolutely fabulous. I was actually heading to my favourite steakhouse and I remembered seeing this recipe and headed to the supermarket instead. It was fast, delicious and saved me a bit of money too. Thank you. EVERYTHING I’ve read on your site looks AMAZING!! I’m normally a desert person, and it was your lava fudge cake with ice-cream that initially got my attention, BUT it was the steak, salmon, scallops, pork chops, stuffed chicken breast, chicken thighs, and all those meatballs that hooked me for good! Girl, whomever lives in your household is some lucky folk! I can’t wait to get back on and look at more tomorrow! Thanks for all of this wonderful dishes and mouth watering videos and pics.